Colours are very important in our lives as they directly influence our emotions. Learn a variety of tinting techniques to add a fresh uniqueness to your millinery range. Unleash the creative artist within whether you are tinting millinery flowers, adding patterns to straw or transforming trims into a kaleidoscope of colour. 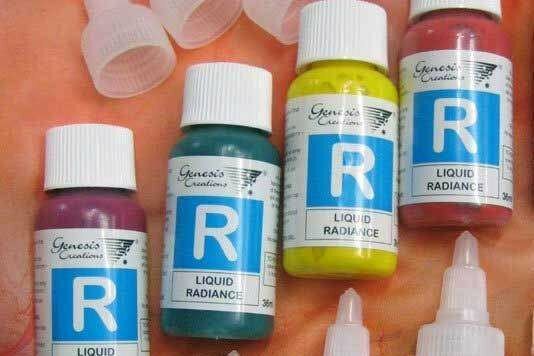 Liquid Radiance is a concentrated range of liquid colours for use on all white or light coloured fabrics ranging from silks and other natural fibres through to 100% synthetic and polyester blends.Liquid Radiance Colours are non toxic, simple, safe and economical. Concentrated colours are diluted with water. These tinting fundamentals teach you the the basics to use these colours and are essential as it has both the properties of a dye and a paint. Learn several tinting techniques to add texture to the flowers appearance. Straws no longer need to be plain as you learn to tint and pattern to all straws whether parisisal, silk abaca, panamas or sinamay. Learn to colour silk abaca and mould various flower petal shapes into uniquely colour tinted flowers for your hats. Also tint feathers to give a complimentary colourful touch to your new headwear design. Liquid Radiance - Course specific colours.